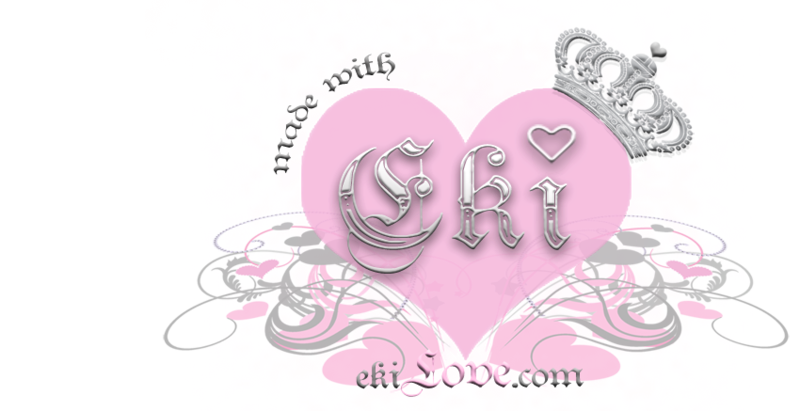 ♥ made with ekiLove ♥: ekiLove's giveaway! and now on twitter! ekiLove's giveaway! and now on twitter! wanted to do a giveaway to say thank you for all the support and stopping by my store, with your support ekiLove now have 300+ followers! This small is a giveaway but its just a little thank you gift :) open to anyone in the world! Thank you so much for your support and Love! I want to see more lacy pouches, and preferably bigger ones too. Also... maybe laptop holders in different sizes, of course with lots of lace =D. Congrats on the followers!! What a cute giveaway. 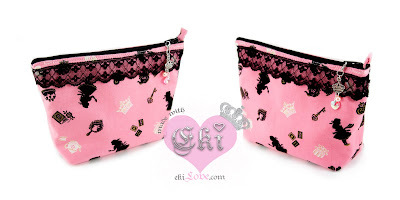 In the future I would like to see you create more dark colored make up pouches and more bag charms! The light colored ones get dirty fast for me because I just dump it in my messy purse. I am following Ekilove on twitter. I forgot to mention, I would love to see more earrings! Your earrings are cute! I am so excited for your giveaway! I love all your beautiful handmade merchandise! I made a blog posting! Thank you for entering me! I've posted about this giveaway in my sidebar! I also followed you on twitter! Congrats on all the love! I've also followed on Twitter!!! Just got my first pair of earrings from you this week. So so in love with it. Definitely would like to see more earrings/jewelry. All your creations are super cute! I'd like to see more jewelry and earrings in the near future! and I am also following ekiLOVE on twitter. i love the danglies you have on the pouches but it would be uber awesome if the dangly charms can be made into charm bracelets. And handbags!!! You have really gorgeous designs. hey!! thanks for the giveaway!! Hi! Your products are so kawaii! I would love to see some laptop pouches, maybe some coin purses;lacey and of course. toki doki/hello kitty. A nice cute camera purse or a dslr bag would be cute too. to think that there aren't any stylish or cute dslr purses out there. it doesn't need to be all thick and bulky. stylish though! <3 Enjoy the love! I'll love to see more earrings of different colors and maybe necklaces or charm-bracelets in the future cuz I'm pretty sure they would all be super kawaii! I would like to see cute tote bags. I'd love to see more jewellery and pouches totally adorable!! Hi Eki, would love to see cute handbag organisers! love to see more puoches that a darker in colour and not so many laces and smaller pounches..=) necklaces would be good too! I love your earrings creations, they are very unique. It'll be really great to see matching necklace inspirations for these earrings! Mmm... I realy would like to see some Rilakkuma cellphone/I-pod bags. Oh! And earrings! I looove earrings! Hey eki, what a lovely giveaway your having extremly kind of you! I've been a follower of yours for ages and i love your posts. The thing i would most like to see in your store is belly bars, i would be really interested to see if you could create a beautiful belly bar. I hope thats okay for you, have a loverly day. Wow, you're very talented, I'm happy I found this giveaway! I love make up pouches so I would love to see more of those! I have followed you on Twitter: kewlhat. Thanks so much for having this giveaway! I'd love to see more Sanrio print items! Congrats on having so many followers and thanks for hosting this giveaway. The earrings you make now are so unique. I'd definitely like to see more those. I think I'd like to see some more cell phone/digi cam cases, laptop cases, darker colored accessories (bags, jewelry, whatnot) and some more cell phone chains! All of your current items are so adorable. I just followed your new twitter account too. I have also posted your giveaway on my sidebar. I would like to see cute phone pouches. I like the your light pastel color bags. Especially the ones with wings! I'd like to see some cell phone bags, that would be awesome! I also followed you on twitter (cherrycolors). sincerelyyoursxo@yahoo.com is my email and i would like to see you make some cosmetics! im following you on twitter and im putting you in my blog right no! I'd like to see long chain necklaces, iphone/camera pouches and charmed bracelets. I think it would be nice to see your hair accessories in a wider variety of colors~ And maybe some rings too. I would love to see more earrings, bracelets, necklaces! They're all so cute! I'd like to see more hair deco! I like those bow hair bands you had before, so cute. Thanks for having such an awesome giveaway!! I'd like to see more bags/purses in the future ^___^ ♥ Can't get enough of your creations hehe :D Congrats on the followers! your earrings are adorable and it would be so cute if there were sets!!! Hello and Congrats on the followers. I have posted your giveaway on my blog. Also... I am now a one of your twitter followers. Followed you on twitter, as well! Congrats! Thanks for the giveaway :) So sweet of you. I'd love to see camera cases, coin purses and totes! Hi Eki! What a wonderful giveaway! Hmm, I would love to see more cell phone totes, definitely camera and iphone/mp3 player cases, and some larger purses and totes! I especially adore your frilly lace styles! I would love to see maybe cute brush holder to travel with? Wow, two giveaways?! So cool, and thank you Eki! :) Congrats on all those followers...yay!!! I'm also following you on twitter now too! Thanks for putting this up~! I'm following you on twitter (kittybonkers) and I have posted here about this give away!! i'd love to see the custom pouch xDD i can't waiiiiitttt! OO! camera cases (for point and shoot)? more earrings x3 and CLOTHES!! hehehee. Hey girl. Would love to be entered. I'd love to see more cases for camera, cell phone, laptop, etc. Wow Eki look at all the entries you've got already! Congrats on the 300 followers!! MMm.. that KitKat & Matcha Latte mix looks good!LOL! and i made a blog post on my blog. I'm following EkiLove on twitter (PetSugarShop)! I've posted your giveaway on my blog dropdeadkawaii.blogspot.com ! Oh wow. This is a pretty amazing giveaway. (: Plus, I love that Hime Alice Pouch. Oh so kawaii. PS. I would totally follow you if I /did/ have twitter. Lol. You are so talented. I would like to see some iPod camera pouches. Continue with the good work. yay for give aways~! i love your stuff!! what i would love to see is bigger pouches.. or do something totally random and surprise us! I would like to see Little Twin Stars fabric.. I am staying tune for them! hehe..
Would love to see make-up pouch for brushes.. I'm already a follower. I would love to see more charms and beauty brush carriers. I agree with skully too for more cases for cameras/cell phones etc. I want to see more phone/bag charms as well as headbands with bows! I check your store almost every other day; Love everything you make! Oh I forgot to mention it but I'd like to seen some necklaces from you (above all a signature one and a wing one XD) I'd defitively order one! Enter me please!! i would love to see more earrings because the ones you make are just so kawaii. also more cellphone straps and make up brush rolls. everything you make are just so pretty and princess like!! I love your designs and anything you make would be lovely, can't wait to see more. I'd like to see more earrings and necklaces in the future! Oh! And laptop cases would be nice as well! Love all your creations! I would love to see you make more pouches and small bags. 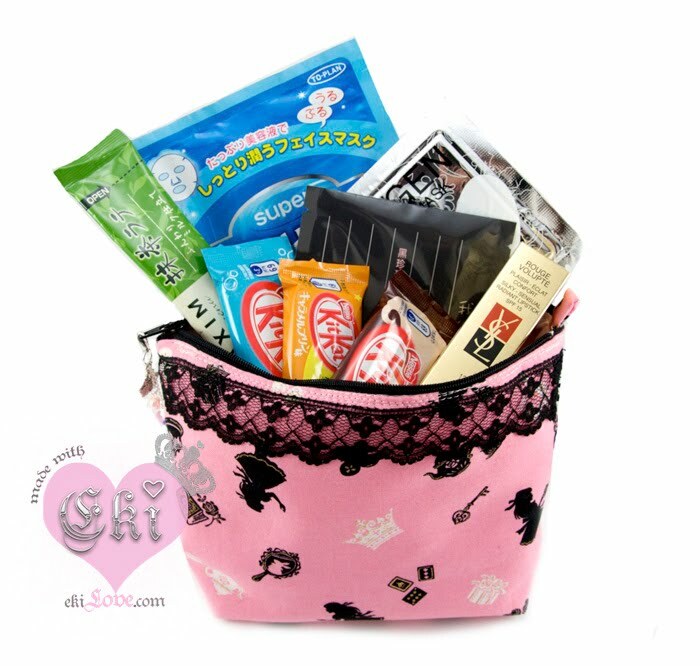 I'll like to see you create kawaii necklaces, braclets and camera pouches , cell phone pouches, sunglass pouches, DS cases, pencil cases & coin purse. Congrats on the 300+ Followers! I'd like to see you make a camera pouch, an ipod touch pouch, and cellphone keychains. ^^ scarves and frilly card holders for the uni students who have to carry identification everywhere would be awesome. i'd love to see more necklaces! since i just bought something from you and kinda have an idea what items your are currently selling, i think it would be nice if you do wristlets and was surprise you don't have necklaces and bracelets. You are one talented girl, you should definitely do more! and yea, more zipper charm please! hi eki! i just bought one of the alice pouches, but i love what you've stuffed this with haha. i'd love to see more hair pieces! I would love love love to see more charms..they're amazingly cute. I actually love all ur designs and think they are all so kawaii^^..I love your earings so much so I'd like to see more hime earings with bows or laces. ps: i just started following you on Twitter! I'd love to see more bracelets! i would like to see more earrings and neckpieces!!! more makeup pouches!!! planner pouches!!! Hi Eki, this giveaway is fab :) thanks! I would like to see more cell phone/bag charms.. and jewelry! Hey Congradz on the 300+ followers!! but anyways i would love to see more jewelry actually. I love your earrings, and I think bracelets or necklaces to go with them would be perfect. I think also along with your pouches, you should make some pencil cases, for students like me. I'm always looking for a new pencil case, college requires you to have numerous pens! I can never find a cute one, or one of the perfect size. hola me enacanta el regalo. me gustaria ver mas pequeños bolsos para maquillaje. Thanks for the fantastic giveaway! I just followed you on twitter (thelostlolli). I love to see more earrings. I already know you make a ton-- but they're beautiful! That and pencil cases/pouches would be awesome! My email address is gvang5@yahoo.com. i followed you on twitter @gracieegrace. I would like to see some bracelets & necklaces. I love your earrings! They are cute. I wrote about your giveaway on my blog: http://conbdebelleza.blogspot.com/2009/12/sorteos-de-bitacoras-y-loteria-de.html (you can use the Google traductor button on the right to traduce it). I follow ekiLove on Twitter (username: ConBdeBelleza). 3. I follow your twitter! I wanna see homemade masks! I would like to see you create more earrings and sets. I'd love to see more necklaces and smaller earrings. You are very talented I would like to see you make maybe clothing accessories such as mittens during winter, scarves, etc. I am following your twitter. i would love if you make more i-phone pouches and maybe a ds case too... maybe some wristlets too!?! I love jewerly with pearls and flowers, I remember long necklaces when I went to Japan. Also pretty earrings. Could you make some please? i would like to see more earrings, too. how about bracelet and headband? 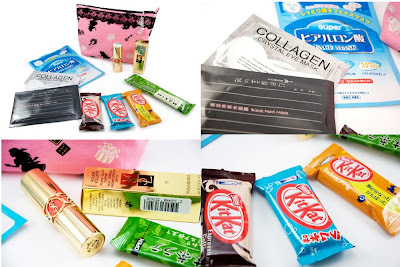 I would love to see a variety of cellphone cases and more makeup pouches. I love your earring creations! Would love to see more! I'm following ekiLove on twitter. I would love to see more earrings with daring, bright colors like the flower and butterfly earrings. I LOVE your jewelry. Thanks so much for giving us the chance to win this giveaway.. the kit kats sound so yummy. I'm your follower via Google Friend connect. I'm following! I'd love to see laptop covers or protectors! I am a follower and i would like to see more cell phone cages. I would really love to see you make more jewelry maybe necklaces & bracelets? But nonetheless anything you make is absolutely cute & chic. So more power & keep at it! A follower here! I'd love to see more bag and cell phone charms! Great giveaway! I would like to see more bigger pouches.. I love them! I would love to see more bracelets/necklaces and wallets (with card slots and a zip-up coin pouch)~ Everything you make is so so kawaii...<3 it! I'm following you on Google! i'm folliwing u on twitter! hi eki! my name is jhee :D i am a follower of you blog! i would love to see in ur blog how to create more earrings and bags, also things to put in your hair. Thanks you so much! I put the contest link in my channel on youtube. Hi Eki! I'm addicted to ekiLove!! I would love to see more earrings and pouches. Love the lacy touches on the pouches. Also possibly future bracelets =). Everything is so pretty. I would also like to see necklaces. Hi, I'm a follower and I'd like to see sleep masks, little wristlet clutches, and headbands. d0ntliet0me at hotmail dot com. Hii Eki! I am a follower =] It would be awesome to see some eki'style handbags in the future =D !! I'm a follower. I would like to see some unique earrings. Enter me please :) and as for items i'd like to see more makeup maybe! In the near future, id like to see more purses definitly ! i love your orangecreme creation<3! very cute ! Perhaps some more jewelries as well? like necklaces & such. Other than that, i'm loving what you already have! keep it up!